HTC Hero (marketed as T-Mobile G2 Touch by T-Mobile in the UK, Austria, Germany, Croatia, the Netherlands, Slovakia, and Hungary; and as Era G2 Touch in Poland) is the third phone manufactured by HTC running the Android platform, announced on June 24, 2009 in London. It is the second flagship Android phone, and the fourth Android phone after HTC Dream, HTC Magic, and the original Samsung Galaxy. Notably, it is the first phone by HTC to feature a 3.5 mm audio jack, multi-touch ability, the HTC Sense user interface, and a "Lite" version of Adobe Flash. The device was released in Europe in July 2009; and in the U.S., via Sprint on October 11, 2009, and via Cellular South on November 9, 2009. 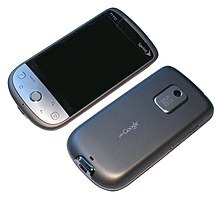 Hero was the first Android phone released in Russia. FCC documents surfaced to show, that there would be a version of HTC Hero supporting Rogers' and AT&T's 3G bands. One such model version was later released in Canada for Telus's new HSPA+ network. The phone was made available in the UK on Orange, 3, T-Mobile, BT Broadband Anywhere (MVNO), and SIM-free. In Australia, it was available exclusively SIM-free (without a contract) through the Harvey Norman retailer. The Sprint, Cellular South, Cellcom, Bluegrass Cellular, Manitoba Telecom Services, NTelos, and Cox Wireless version of the HTC Hero is different from those that are sold in Asia, Canada and Europe. The outer body is significantly altered, with the controversial "chin" that is present on the Asian, Canadian (some providers) and European models being removed in favor of a smooth, beveled surface where all but two of the once raised buttons now lie flat. Also due to performance issues some of the clock animations were removed. Some carriers may market it as the HTC Android 6250. 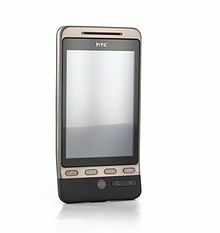 A modified version of the Hero, the HTC Droid Eris, was released on the Verizon Wireless network on November 6, 2009. Pictures of Google's CEO, Eric Schmidt were circulated showing him holding the Droid Eris after a press conference that announced an Android-centric partnership between Verizon and Google. The Verizon Wireless version, unlike the Sprint and GSM versions, features a proximity sensor. The Eris was succeeded by HTC's Droid Incredible in 2010. HTC Hero is the first phone to feature HTC's own "Sense" software, which includes a customized user interface. There had been initial issues regarding lag on the device, however a firmware upgrade resolved the problem to some extent. HTC announced their intent to release an update for the Hero in the first half of 2010 that would upgrade the Android OS to version 2.1 while incorporating Sense. This news was released via Twitter on December 17, 2009. Sprint further clarified on their own Twitter that the 2.1 update would be released early in the second quarter of 2010. By May 14, 2010, Verizon Wireless had made a system update to Android version 2.1 publicly available for their Droid Eris. The Sprint Hero 2.1 update was released on 19 May 2010. The update to 2.1 was officially released on the HTC website for the Sprint (CDMA) version. On June 4, 2010, the Android 2.1 update for the GSM Hero was made available in Taiwan. On June 17, 2010, the first part of Europe was provided the update, the second part on June 28, 2010. The Worldwide English (WWE) version was released on June 28, 2010. HTC suggested that they would not be updating the device further to version 2.2. Although the 2.1 update was officially released by HTC, a few networks refused to allow the Hero phones running on their networks to receive the update. Most notably, Orange in Europe did not announce any officially update policy or guidance for the phone despite numerous requests for their customer base until late July 2010. This proved to be so frustrating to consumers that a Facebook group was set up to try to gain more information from Orange and their lack of support for the HTC Hero. Nevertheless, on 28 July 2010, part 1 for the 2.1 update was released OTA (over-the-air) to Orange handsets. Three UK released the full 2.1 update OTA on 26 August 2010. The 2.1 update noticeably increases the browser speed and there appears to be an automatic closing of background apps as system resources diminish with increasing multitasking. Telus had also refused to offer guidance or an update for their HTC Hero. While initially slated for release in May 2010, by mid-August no update had yet been released to Telus customers. Furthermore, customer service at Telus complained that the fault lies with HTC. On the morning of 25 October 2010, Telus officially pushed down the Android 2.1 update to its clients. Sprint drew the ire of many of its HTC Hero and Samsung Moment customers when it announced in June 2010 that it would be upgrading its Android devices to Android 2.2, but later corrected the statement to say that the upgrade would only be available for the HTC Evo. The criticism had been particularly fierce from those who purchased the Hero on 2-year contracts shortly before and even after Sprint effectively ended the upgrade lifespan of the phone. Widely reported problems with Android 2.1 on the Hero further fueled criticism among customers who felt Sprint had shirked its responsibility to acknowledge and fix confirmed problems with the device. Separately, numerous groups have created custom ROMs for both the CDMA and GSM versions of the HTC Hero based on various versions of Android 2.1, including the popular VillainROM, CyanogenMod, and others. Although there is not an official version of Android 2.2 for the Hero, several third-party groups have created functioning ROMs which include this. A popular Android 2.2 ROM for the GSM HTC Hero is FroydVillain. Android 2.3 has also been ported to the GSM HTC Hero by the popular aftermarket firmware creation team CyanogenMod. The final stable version 7.2 (based on Android 2.3.7) was released on June 16, 2012, and has been reported as fully operational. ^ "HTC Mobile Phone Support - HTC Hero (Sprint) - Tech Specs". Htc.com. Retrieved 2011-10-31. ^ "HTC Mobile Phone Support - HTC Heroâ"¢ (Sprint) - Storage Card". Htc.com. Retrieved 2010-10-30. ^ "HTC Hero Official Specifications". Archived from the original on 2009-10-18. Retrieved 2009-10-21. ^ "HTC Droid Eris". Retrieved 2009-11-13. ^ Nield, David. "Path of the One". TechRadar. Retrieved 2 April 2014. ^ "HTC Hero: The first Android device with Flash, 24 Jun 2009". Adobe. Retrieved 2010-04-08. ^ "Sprint HTC Hero now on sale to everyone". Engadget. 2009-10-11. Retrieved 2010-04-08. ^ "Обзор коммуникатора HTC Hero: Первый Android в России" [Review of the HTC Hero communicator: The first Android in Russia] (in Russian). Russia: Mail.Ru. Archived from the original on 2012-06-28. ^ "HTC Hero hits FCC with US 3G". Engadget Mobile. 2009-07-02. Retrieved 2010-04-08. ^ "What Verizon Android device is Eric Schmidt holding? « Boy Genius Report". Boygeniusreport.com. 2009-10-06. Retrieved 2010-04-08. ^ "HTC Hero updated firmware arrives in Denmark [Update 2]". SlashGear. 2009-09-11. Retrieved 2010-06-01. ^ "Sprint's Hero finally gets official Android 2.1 upgrade". HTC Hero. 2010-05-19. Retrieved 2010-10-30. ^ "Twitter / HTC: Anybody notice the clarifi". Twitter.com. 2009-12-17. Retrieved 2010-04-08. ^ sprint. "Twitter / sprint: Android update! Upgrades t". Twitter.com. Retrieved 2010-04-08. ^ "Sprint HTC Hero Android 2.1 Update Released". Retrieved 2010-05-19. ^ "Support". HTC. Retrieved 2010-10-30. ^ "Android 2.2 Froyo: No Update to HTC Hero, Legend and Droid Eris phones? : Product Reviews Net". Product-reviews.net. Retrieved 2010-10-30. ^ "Niet compatibele browser". Facebook. Retrieved 2010-10-30. ^ "Telus HTC Hero 2.1 update "delayed to the first week of May"". MobileSyrup.com. Retrieved 2010-10-30. ^ "HTC Mobile Phone Support - HTC Heroâ"¢ (Telus) - Downloads". Htc.com. Retrieved 2010-10-30. ^ "2.1 Problems - Issues - Quirks". Android Forums. 2010-07-06. Retrieved 2010-11-09. ^ "Sprint expects to launch Android 2.2 in near future". Sprint Community. 2010-06-25. Retrieved 2010-09-05. ^ "FroydVillain". VillainROM. 2010-11-22. Retrieved 28 November 2010. ^ "CyanogenMod 6.0.0 for Htc Hero Gsm/Cdma Alpha Preview". CyanogenMod. 4 July 2010. Archived from the original on 25 August 2010. Retrieved 22 August 2010. ^ "Cyanogen forum". Archived from the original on 2012-08-03. Wikimedia Commons has media related to HTC Hero.